This past Saturday we had a big change for Science Saturday! One of the challenges with using a public space is sometimes there are events that take over your space. We had such an experience when the Rock and Roll marathon moved in. This sent us to Couterie Forest which is also in City Park but far from the hubbub of the marathon. Couturie Forest is a small peninsula that is covered in thick forest and clearly defined paths. There are thickets, trail signs, an outdoor classroom and an observation deck. It is an ideal spot for nature exploration. We had such a wonderful day that we will be using this location from now on unless it is a rain day. Our day started at the picnic benches under the live oak trees. 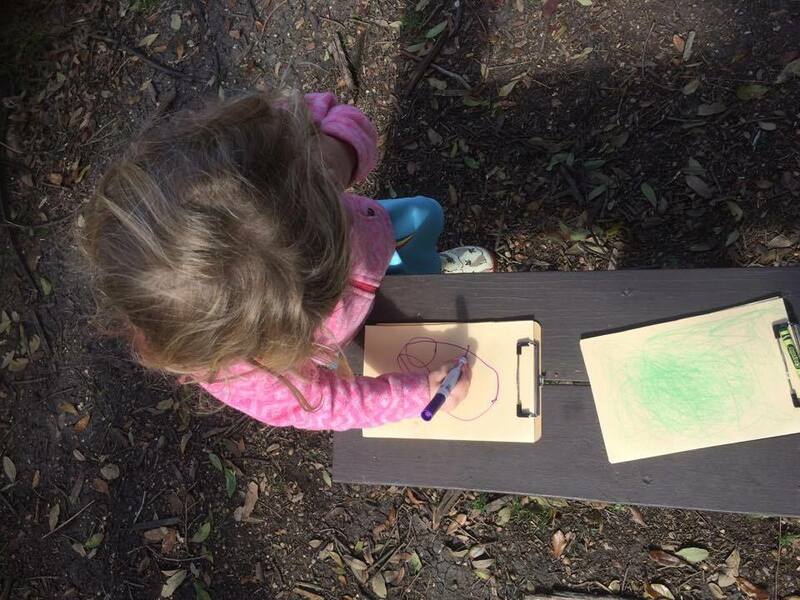 There were crayons, paper, books, and binoculars.After everyone arrived we gathered together to talk about our next adventure. We set up some trail rules and wondered about some of the things we might encounter. 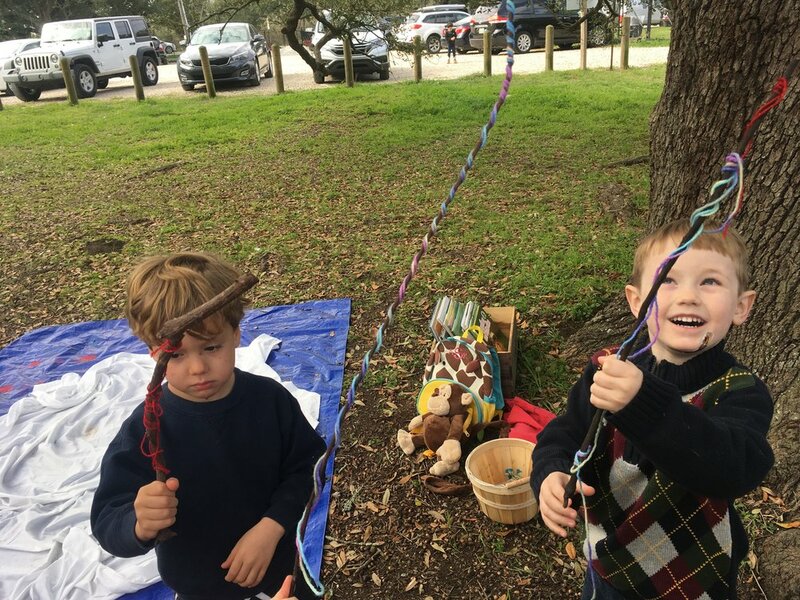 Everyone had a chance to make a trail stick by chosing a string to wrap decoratively around it. Once everyone was prepared for the hike we set off. Our trail began by crossing over the big red bridge. We took a moment to stop and look out at the water. Eleanor noticed that there were a lot of plants in the water on one side of the bridge and not that many on the other side. The children of the NOLA Nature School are walking down a freshly-mulched path when, suddenly, they see a tree. The tree has a noticeable black line hewn into the side of its brown trunk. “He cuts something,” Emerson said. The children continue to wonder at the tree, before moving on. Amelia, however, pauses and opens up the an insect identification guide. Amos stands near her. She flips to the middle of the book as Amos looks on. “Which bug might it have been?” Mr. Ron asks. 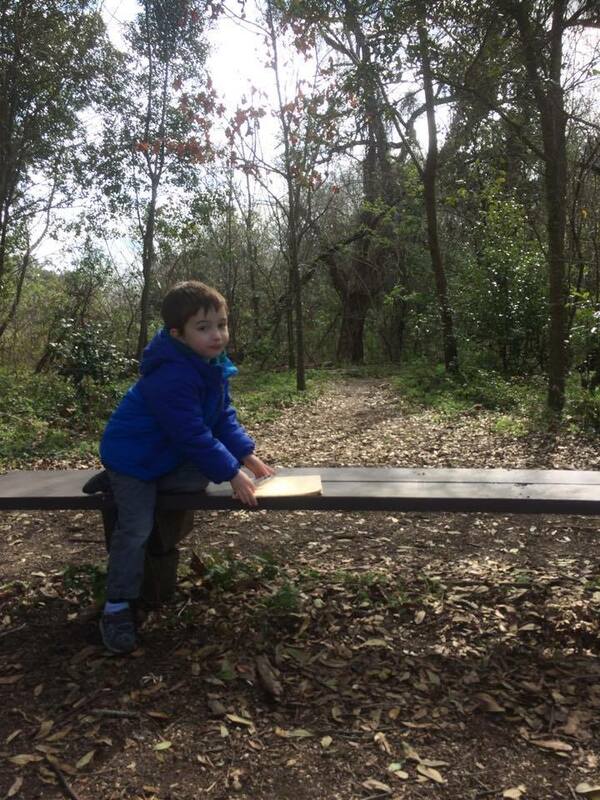 The trail leads us to a series of benches set up for an outdoor classroom. This is where we stop to set up snack and explore the woods in more depth. Quickly a few of the students are foraging in the undergrowth for bugs and sticks. Beau returns from a hunt carrying a very large tree branch. He proudly shows his friends his find. In the ensuing excitement a large collection of sticks and logs is piled on a bench. This is quickly named The Birdhouse in honor of the small box we saw in a tree on our hike. The end result had some structural issues and was not approved for habitation but it was decided that next week we will try to build a more sound teepee that could be used as a fort. Miss Karin took a group of friends to the observation deck just next to the classroom area. This is a wonderful wooden platform that juts out above the water. The children were able to watch the movement of the water and inquire about the plants beneath and growing along the bank. They even saw a number of birds land on the water, logs near by, and take off again. We look forward to getting to know our forest even better! See you on Saturday!